Barack Obama entered with high hopes of improving the U.S. image among Muslims worldwide, hauling out his middle name, giving his first interview as president to Al-Arabiya television, quoting hadith, giving major speeches in Istanbul and Cairo, and talking ceaselessly of "respect" for Muslims. Where has this got him? The Gallup Poll conducted face-to-face interviews with 1,000 adults aged 15 and older in each of Mauritania, Algeria, Egypt, the Palestinian Territories, Lebanon, and Iraq (a curious collection of places). It asked the same question once in 2008, twice in 2009, and now for the first of two times in 2010: "Do you approve or disapprove of the job performance of the leadership of the United States?" The margin of error ranges from ±3.1 percent to ±3.9 percent. Gallup's results show something of a wash: Obama does distinctly better than George W. Bush in Mauritania (going from 44 to 69 percent) and Egypt (6 to 19 percent). He improves on Bush just over the margin of error in Algeria (going from 25 to 30 percent). He improves on Bush within the margin of error in the Palestinian Territories (from 13 to 16 percent). The two are tied in Lebanon (at 25 percent). And Obama does worse than Bush in Iraq (going from 35 to 30 percent). Also noteworthy is that Obama's current standing has declined among all six of the populations from what it was in mid-2009. 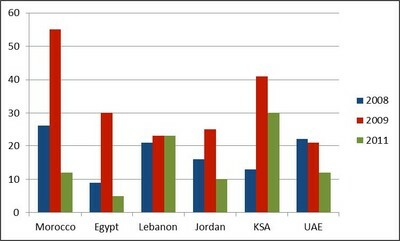 The smallest drop (3 percent) was in Iraq and the largest (18 percent) in Egypt. 'He talks too much," a Saudi academic in Jeddah, who had once been smitten with Barack Obama, recently observed to me of America's 44th president. He has wearied of Mr. Obama and now does not bother with the Obama oratory. He is hardly alone, this academic. In the endless chatter of this region, and in the commentaries offered by the press, the theme is one of disappointment. In the Arab-Islamic world, Barack Obama has come down to earth. He has not made the world anew, history did not bend to his will, the Indians and Pakistanis have been told that the matter of Kashmir is theirs to resolve, the Israeli-Palestinian conflict is the same intractable clash of two irreconcilable nationalisms, and the theocrats in Iran have not "unclenched their fist," nor have they abandoned their nuclear quest. There is little Mr. Obama can do about this disenchantment. He can't journey to Turkey to tell its Islamist leaders and political class that a decade of anti-American scapegoating is all forgiven and was the product of American policies—he has already done that. He can't journey to Cairo to tell the fabled "Arab street" that the Iraq war was a wasted war of choice, and that America earned the malice that came its way from Arab lands—he has already done that as well. He can't tell Muslims that America is not at war with Islam—he, like his predecessor, has said that time and again. Pew confirms that Obama's standing among Muslim is cascading. The last pillar of President Barack Obama's Middle East policy, his alleged popularity in the region, has gone bye-bye. All the apologies, distancing from Israel, the Cairo speech, the Istanbul speech, the engagements with Syria and Iran, the ban on using the word "Islamism," and all the other apparatus of the new, non-strategic strategy have availed him—and U.S. interests—not. Aug. 5, 2010 update: The Brookings Institution and Zogby International today issued a "2010 Arab Public Opinion Poll" covering Egypt, Jordan, Lebanon, Morocco, Saudi Arabia, and UAE. It goes further than prior surveys in documenting the collapse of Arab support for Obama. "How would you describe your views of President Barack Obama of the United States?" In 2009, 45 percent answered positive, 28 percent neutral, and 23 percent negative. Those figures in 2010 are, respectively, 20, 16, and 62. "How would you describe your attitudes toward the Obama Administration policy in the Middle East?" In 2009, 51 percent answered hopeful, 28 percent neutral, and 15 percent discouraged. Those figures in 2010 are, respectively, 16, 20, and 63. With dreary predictability and perfect-pitch obsession, the conductor of this poll, Shibley Telhami, commented that "the data leaves little doubt that the deciding factor in the shift of opinion toward the Obama administration is disappointment on the Israeli-Palestinian issue." May 17, 2011 update: A Pew Global Attitudes poll of eight Muslim populations finds more dismal news for Obama. in key Arab nations and in other predominantly Muslim countries, views of the U.S. remain negative, as they have been for nearly a decade. Indeed, in Jordan, Turkey and Pakidstan, views are even more negative than they were one year ago. With the exception of Indonesia, Obama remains unpopular in the Muslim nations polled, and most disapprove of the way he has handled calls for political change roiling the Middle East. Moreover, many of the concerns that have driven animosity toward the U.S. in recent years are still present – a perception that the U.S. acts unilaterally, opposition to the war on terror, and fears of America as a military threat. And in countries such as Jordan, Lebanon, and Pakistan, most say their own governments cooperate too much with the U.S.
much of the hate on the Palestinian street was also directed toward Obama personally. In this regard, Obama can only blame himself for the reason why he has become a hated figure in the Arab and Islamic countries. Obama's famous Cairo speech at the beginning of his first term in office created the impression among many Arabs and Muslims that this U.S. president was "one of ours" and would do everything they expected from him—including forcing Israel to make unimaginable concessions. But as Obama has failed to rise to their expectations, Arabs and Muslims are condemning him as a Zionist agent and an enemy of Islam. Now that Obama has chosen Israel as the first country to visit at the beginning of his second term, he should expect more anger and hatred from Arabs and Muslims. His statements upon his arrival, in which he repeated U.S. support for Israel, have already drawn strong condemnations from Palestinians. As the accompanying charts indicate, other than a microscopic up-tick in favorability toward the United States among Palestinians, regard for both the country and Obama have declined among Muslims everywhere since 2009, with Turkish views toward Obama having trended the most negatively. July 13, 2011 update: Two months later and Zogby International finds an even more dramatic collapse in favorable attitudes toward the United States in six Arabic-speaking countries. In five of the six, Obama initially scored much higher than Bush and in five of the six, a huge fall off took place between 2009 and 2011. Morocco and Egypt are particularly dramatic: in both countries, Obama more than doubled Bush's favorable, then his crashed to less than half of Bush's. Zogby International documents the collapse in Obama's favorables. Aslo noteworthy: Recep Tayyip Erdoğan's Turkey has emerged as the most popular outside state. Turkey's AKP is flying high in Arab opinion. 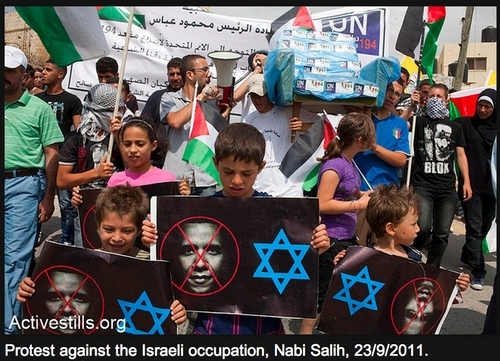 Sep. 23, 2011 update: A typical rally against Israel, with a side-swipe against Obama, in the West Bank village of Nabi Saleh. May 27, 2012 update: Thousands of supporters of Ansar Al-Shari'a in Tunisia (AST), an extreme Salafi group, rallied in Kairouan, Tunisia, on May 20, MEMRI reports. A video clip includes the crowd yelling out: "Obama, Obama, we are all Osama" and the speaker referring to "Obama the ape." Palestinian demonstrations against U.S. President Barack Obama's upcoming regional visit intensified on Monday, with activists in Bethlehem spray painting swastikas over a poster emblazoned with a blue and white portrait of Obama. Hundreds of demonstrators gathered in Bethlehem to stage a protest against the U.S. president , who will visit the city later this week. According to protesters, Obama is persona non grata in Palestinian territories because of his "bias in favor of Israel." The Palestinians have long felt aggrieved by the U.S., accusing it of favoring Israel over the Palestinians. Palestinians in Bethlehem tore down a banner of the U.S. president , hurled shoes at it and spray painted it with swastikas. Footage of the incident showed a taxi driving over the banner before it was set on fire. 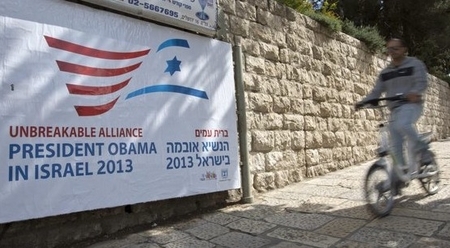 While the Palestinians insult Obama, the Israelis welcome him. Palestinians in the Gaza Strip were also vexed by the visit. Hundreds of Palestinian activists rallied in Gaza City on Wednesday denouncing Obama as "a Zionist collaborator" and torching posters of the American president. Doha Institute surveys Arab opinion on Obama's United States.